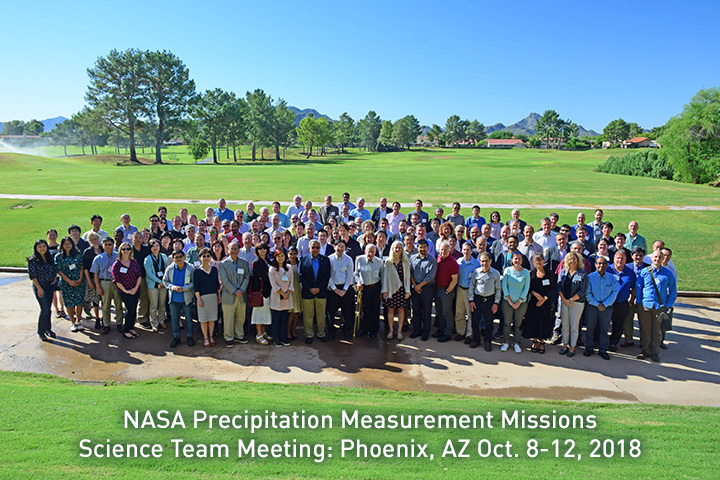 The NASA Precipitation Measurement Missions (PMM) Science Team conducts scientific research (including algorithm development, mission implementation, product validation, and data utilization) in support of TRMM and GPM Missions. The team comprises scientists funded by NASA and international investigators selected by NASA on the basis of no exchange of funds. Here you will find a variety of resources to assist you in making a visit to a local school, day care center, or after school group. Make a difference in the lives of young people by sharing what you do and the excitement of learning about GPM, Earth’s freshwater resources, and the water cycle. NOTE: The 2019-2021 PMM Science Team has been selected, please click here to view the principal investigators and proposal titles. Shepherd James University of Georgia, Athens The Energy-Water-Food Nexus Within the Backdrop of an Urbanized Globe: How Can GPM Help? NASA Headquarters has authorized a new funding strategy called "Work Packages" whereby key Principal Investigators at NASA centers who are repeatedly funded under ROSES calls are preselected outside of the ROSES call. This is a listing of the approved Work Package Principal Investigators and their topics for the 10th PMM ROSES Science Team (nominally 2018-2020). Cecil, Daniel Better Understanding GPM Radiometer Measurements Using Ground-Based Radar GPM, TRMM and related satellites have observed a huge number of precipitating systems around the globe. Pairing high-quality ground-based radar data with coincident satellite observations helps us learn to better interpret the satellite data, and to apply that understanding to satellite observations from otherwise data-sparse regions. This work aims to (a) improve understanding of how different hydrometeor types (and their vertical profiles and amounts) relate to observed satellite measurements; (b) investigate precipitation retrieval quality (error characteristics and biases) associated with particular hydrometeor types or profiles; (c) investigate characteristics of precipitation systems (and their related weather and climate patterns) around the globe. Comprehensive science algorithm development, implementation, maintenance, and validation, including user support, for quasi-global combined-satellite precipitation estimates at fine time/space scales, both in near-real and post-real time. This work includes extending the Integrated Multi-satellitE Retrievals for GPM (IMERG) to polar regions. Development, scientific enhancement and validation of the Dual-Frequency Precipitation Radar (DPR) Surface Reference Technique (SRT) will be pursued by extending the dual-frequency version of the method (DSRT) to the new proposed scan geometry. In addition, hybrid path attenuation estimates will be formulated by merging the SRT with the the Hitschfeld-Bordan (HB) method of attenuation correction, which performs well at light rain rates. Tests of the performance of the hybrid estimates will be done by adding new code and new output variables to existing operational codes. Continue to improve representation of surface properties through physical and statistical models that account for correlated properties of emissivity and radar backscatter in the CORRA forward model. Integrate retrievals of surface and atmospheric state (including ocean surface wind, land emissivity, water vapor, clouds, and light precipitation) in regions where DPR does not detect precipitation. The overall effort is aimed at the development, delivery, maintenance, and validation of the Combined Radar-Radiometer Algorithm (CORRA) by improving the physical parameterizations of precipitation in all phases. The science emphasis will be on the further exploitation of non-spherical ice and mixed-phase precipitation particle models, as well as particle size/habit distribution evolution simulations, to support improved descriptions of the bulk radiative properties of these precipitation types in the algorithm. Precipitation phase transitions in stratiform, convective, and near-convective regimes will be addressed. Validation of particle models will employ airborne remote sensing and in situ data from recent field campaigns, as well as GPM DPR-GMI data and coincident ground observations. Existing GPM-GV field and Validation Network datasets collected in warm and cold-season regimes are used to relate 3-D precipitation character and process variability to GPM retrieval algorithm constraints and performance. GV polarimetric radar and disdrometer-derived quantities of precipitation rate/content, type (rain, snow, convective, stratiform), and size distribution are processed and analyzed to relate dominant inter- and intra-footprint scale precipitation process/parameter variability to performance and improvement of key GPM algorithm components including path integrated attenuation, non uniform beam filling, retrieval of the rain drop size distribution, and estimation of rain and snow water-equivalent rates. This work will provide dynamic emissivity estimates over land surfaces to support physical precipitation retrievals for GPM. The dynamic emissivity approaches include physical variables such as leaf area index and soil moisture as well as empirical combinations of channel brightness temperatures, including their time variations. These global emissivity estimates are to be integrated and tested within the GMI GPROF algorithm. This work includes improving simulations/models for a wide range of precipitating cloud systems, from weak, unorganized isolated rain showers to intense mesoscale convective precipitation systems to large-scale synoptic snow storms, and their associated precipitation structures, latent heat release profiles and cloud microphysical processes. Data from GPM field campaigns will be used to validate and improve the microphysical processes in the high-resolution numerical models. Consequently, this work also expands and improves the performance of the Goddard Convective-Stratiform Heating (CSH) algorithm for the TRMM and GPM eras by using the improved model simulated latent heating, radiation and surface rain/snowfall data. Leveraging of GPM international partner research activities and infrastructure enables coordinated global precipitation remote sensing research and ground validation activities to be conducted. Here “global” refers to both geography and precipitation regime- enabling gap-filling observations and complementary research to more completely validate satellite observations around the globe. Within this framework specific collaborations between PMM Science Team investigators, GPM GV, and international partners have been sought. Currently active * collaborations are outlined in the below table. Korea G. Ryu, G. Lee, S. Joo Ground validation, precipitation process studies and field measurement (rain, orographic snow), mid-latitudes land/sea. * Note: The formal list of collaborators is dynamic, often a function of partner funding status and guided research focus.